American rabbi; born at Csaba, Hungary, Oct. 14, 1848. He was educated at the University of Prague, and received his rabbinical diploma from Rabbi Judah Teweles of that city. 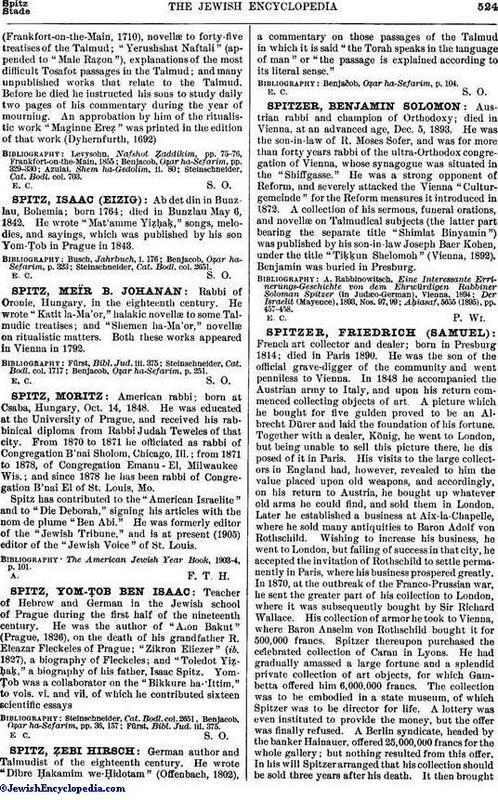 From 1870 to 1871 he officiated as rabbi of Congregation B'nai Sholom, Chicago, Ill.; from 1871 to 1878, of Congregation Emanu - El, Milwaukee, Wis.; and since 1878 he has been rabbi of Congregation B'nai El of St. Louis, Mo. Spitz has contributed to the "American Israelite" and to "Die Deborah," signing his articles with the nom de plume "Ben Abi." He was formerly editor of the "Jewish Tribune," and is at present (1905) editor of the "Jewish Voice" of St. Louis. The American Jewish Year Book, 1903-4, p. 101.